Product #27174 | SKU A-6280A-GB | 0.0 (no ratings yet) Thanks for your rating! 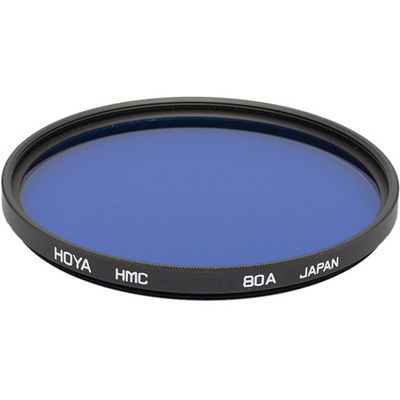 The Hoya 62mm 80A Hoya Multi-Coated (HMC) Glass filter is blue. It is used to balance daylight film under artificial, tungsten or standard (household) incandescent lighting. Let's say you're at a family gathering and you'Voe brought your camera and want to take some photos of this once-a-year gathering. You have traditional daylight balanced film but find yourself in a room filled with table lamps. If left unfiltered, your photos will turn out yellowish. Under certain circumstances, perhaps a nice effect but not flattering in terms of skin tones or what our eyes are used to seeing or expecting. Enter the 80A filter! This filter allows you to "balance", i.e. bring back, correct colour tone to your images. There is some loss of film speed that may require the use of a tripod but, at least, your photos will demonstrate the proper tonality they so richly deserve. Hoya makes the 80 series of filters in many sizes to accommodate the many uses this filter has. This filter can be used by the pro and amateur alike, weekend photo warrior or pro cinematographer and must be considered an essential addition to any photo arsenal. Hoya is one of the largest manufacturers of glass in the filter industry. In collaboration with its parent company, Tokina Optical, Hoya continues to strive to produce some of the best glass on the market. Currently, they hold 40% of the world's market for optical glass. The advantage of Hoya filters is that Hoya puts one layer of anti-reflective coating on each side of their glass. It is not bare glass. Even if the glass is not multi-coated, this kind of production tends to minimise flare and ghosting.